Ever wanted to buy a bullet journal? Have you been inspired by your favorite bloggers or through scrolling on pinterest? Here’s what you need to know. Bullet journals are great! They’re an amazing way to stay organized while letting people channel their creative side. But in retrospect, there’s definitely some things that pull people away from them. – They are a great way to stay organized. You can use the boxes to create a planner set up that works the best for your own individual style. So if you like the monthly, weekly, or daily set up; you can create that. If you like paragraph style or a more vertical layout, it’s all in your hands to decide. – It’s a good creative outlet. All over pinterest there’s endless bullet journal page ideas of places to travel, books you’ve read, monthly habit trackers, favorite foods, the list goes on. I used to do a page in my bullet journal every day, and I’d spend hours designing, coloring, and filling in each page. It was a lot of fun! It’s almost like a coloring book that has multiple purposes. Not only is it just for coloring, but for planning, memories, and just a collection of all of your current interests. – It’s relaxing. If you’re like me and always have to be doing something, the bullet journal is great! I would pull out my journal anytime I had time to kill or whenever I was super stressed, and it calmed me down while keeping me busy. Mostly because it made me so excited to see all of the pretty pages I was creating! But just sitting and drawing always got my mind off of anything that was stealing all of my attention and happiness that day, which was really nice. – They’re good if you have a goal in mind. 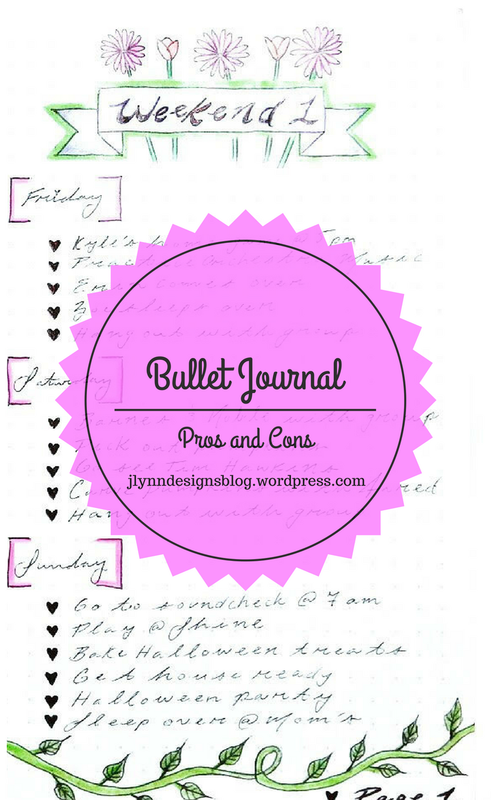 If you like things done a very specific way like I do, the bullet journal is great for you. I love being in control of everything that’s being put into the pages. All of the colors and designs used are all ones that I love, which makes my soul happy. – They take up a ton of time. If you’re looking for a quick way to plan your week the way you like it, the bullet journal is not for you. It takes a lot of time to design each page, and even if you have a set weekly design, it’ll still take up a good portion of time to create. When I used my bullet journal, sometimes I would forget to create that weeks pages, and I would scramble to design the pages so I could write down whatever I needed to write at that moment and then I’d just be left obsessing over the fact that the pages aren’t as pretty as the other ones, because I rushed to fill it in. If you don’t mind spending quality time decorating weekly/daily pages, then you’ll maintain a good relationship with your bullet journal! – They aren’t for people who don’t like to draw. If you didn’t know by now, the bullet journal is all self made/created. You don’t have to be amazing at art or drawing, you just have to like doing it! If the last thing you’d want to do is draw, the bullet journal is not the best option for you! – They’re terrible for perfectionists. If you freak out over uneven lines or small marks in places, you’ll probably have a tough time using the bullet journal. Since you are in control over everything that goes into it, you’re the one drawing all of the lines and designed everything that’s going into this book. If you need everything to be symmetrical, you’ll probably get upset a lot. Even though there’s dashes to follow on each pages to guide you, your designs will never be “perfect”. I used to struggle a lot with OCD and middle school me would’ve HATED the bullet journal.